This is a guest post from my good friend Dominique, who has contributed to my site in the past with her fantastic review of Roman Holiday, and I hope will continue to contribute in the future. 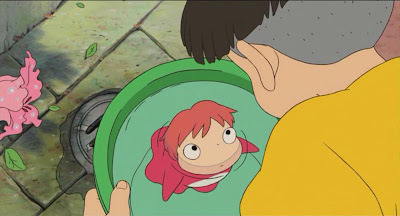 As I was nearing the end of Ghibli month, and had a lot on my plate, I asked Dominique to share her thoughts on Ponyo, one of several Ghibli film I still am still yet to see. I thank her for taking the time to construct a review. I hope you all enjoy it. I owe a great deal to Ponyo. It was this film – the innocent tale of a friendship forged between a little boy and a “goldfish” – that first introduced me to the wonderful, mystical; and phantasmagorical world of Hayao Miyazaki and Studio Ghibli. As it was the first Miyazaki film I had the privilege to see, Ponyo remains a film that I hold in high esteem, although I’ll admit that after having gone on to see such creative masterpieces as Spirited Away or Howl’s Moving Castle, I don’t consider it to be my ‘favourite’ – if we can speak in such simplistic terms – of Miyazaki’s works. This release comes courtesy of Transmission Films. Australia's Transmission Films has welcomed the start of filming in Scotland today of The Railway Man, directed by Jonathan Teplitzky and starring Oscar winners Colin Firth and Nicole Kidman and emerging star Jeremy Irvine. Stellas Skarsgard and Hiroyuki Sanada have also joined the stellar cast. Principal photography starts in Scotland on April 30. The 10-week shoot then moves to Thailand and Queensland, Australia. Adapted by Frank Cottrell Boyce and Andy Paterson from Eric Lomax's best-selling book, The Railway Man is the epic true story of a war hero and the woman who matched his courage to reclaim the man she loved. Eric Lomax (Firth) was one of thousands of Allied prisoners of war forced to work on the construction of the Thai/Burma railway during WWII. Years later, still haunted by memories of brutality and torture, he met a beautiful woman on a train. Patti (Kidman) was determined to rid Eric of his demons. With the help of a wartime colleague (Skarsgard), she set up a mission back to the Bridge on the River Kwai were Eric would confront his tormentor, Nagese (Sanada). Paterson and Tepliztky's previous production, Burning Man, premiered at last year's Toronto International Film Festival and was distributed by Transmission Films in Australia and New Zealand. Andy Paterson last worked with Colin Firth on The Girl With A Pearl Earring. His previous films, including Hilary and Jackie, Restoration and Beyond the Sea have received multiple Oscar and BAFTA nominations. Chris Brown is an award-winning producer whose credits include The Company of Wolves, Mona Lisa, Dancing Through the Dark, The Proposition and Daybreakers. Based in Australia, he owns production company Pictures in Paradise in Queensland. In 2004 Brown won Independent Producer of the Year from the Australian Producer's Association. "We are overjoyed to be working with Jonathan, Andy and Chris again, and the accomplished creative team and cast they've brought together for what we know will be a remarkable film. The Railway Man is truly an international production, with a story that has roots in Australia plus a wealth of Australia talent in front and behind the camera. This will be a major film for 2013," said Transmission Film's Andrew Mackie. There is another new trailer for Prometheus available to watch online. This one is titled the 'International Launch Trailer' and I believe it features some more new footage. I have not yet watched it - and I feel like one trailer, this one, was enough for me. I am really looking forward to the film, but are all these new trailers really necessary? Prometheus opens in Australian cinemas June 7. The ambitious Cafe De Flore, Written and directed by Quebecois filmmaker, Jean-Marc Vallee (C.R.A.Z.Y and The Young Victoria), is a dazzling construction; beautifully photographed and edited, with a crisp sound design and memorable soundtrack, and a dual-strand plot that is mystifyingly complex, densely layered, and consistently challenges the audience’s perception with its energetic non-linear narrative style. For a while one wonders how these two stories will ever be connected and the film’s mystery in the end rests in how one interprets the extraordinary connection – between the past and the present, between the timelessness of love and whether attraction is influenced by forces beyond nature, and the extraordinary power of music. Café De Flore garnered 13 nominations for the 2012 Genie Awards, and Vanessa Paradis won for Best Actress. Two stories, which unfold decades apart, are elegantly intertwined in Café De Flore. The first, set in Paris in 1969, chronicles Jacqueline (an astounding Vanessa Paradis), as she raises her son, Laurent (Marin Gerrier), born with Down Sydnrome. Abandoned by her husband, but determined to give Laurent a fighting chance at life – despite a very short life expectancy - and ensuring a smile never leaves his face, Jacqueline puts him through a strict daily regimen with intense devotion and unwavering affection. This includes listening to Laurent’s favourite song, 'Café De Flore' by Doctor Rockit, a series of vitamin supplements and an inventive walk to school, with stops to take in the city's small pleasures. Her largely peaceful existence is thrown into turmoil when Laurent develops sweet but ultimately unhealthy affections for his classmate, Vero (Alice Dubois), who also suffers from Down Syndrome. In present-day Montreal the focus is on a handsome and successful D.J, Antoine (Kevin Parent, in his debut film role), who seems to have it all. He lives in a lavish home with his beautiful girlfriend, Rose (Evelyne Brochu), and has two daughters. The girls’ mother, Carole (Helene Florent), was Antoine’s first love in high school and everyone, Antoine's parents most of all, expected them to be together forever. They were inseparable romantics, shared a passion for music, and if love was written in the stars, it was evident in this pair. But their growing differences – Antoine, a globe-hopping D.J, suffered from alcoholism and drug problems - have resulted in their separation. Now here is a quality Australian film. Wish You Were Here is a relevant, engaging and cleverly conceived drama, and the directorial debut of veteran actor Kieran Darcy-Smith. It is co-written by Darcy-Smith and his wife, Felicity Price (who also stars) and impressively, was selected to screen at the 2012 Sundance Film Festival. Blending the vibrant atmosphere of a beautifully lensed Cambodia with a suffocating and threatening mood of Sydney, this taut and powerfully acted story is told through a non-linear narrative style – and is amongst one of the better Australian films I have seen in the last few years. At least, it was one of the most emotionally stirring and conceptually satisfying. Alice (Felicity Price) and Dave (Joel Edgerton), soon to become proud parents of their third child, decide to accompany Alice’s sister Stephanie (Teresa Palmer) and her boyfriend, Jeremy (Anthony Starr), on a spontaneous trip to Cambodia. Jeremy, a businessman, is in town for work, and Steph, believing that her sister could use a tropical reprieve before adding another little one to the family, invites her along. Their relaxing retreat – and the sights and sounds of the country are conveyed during a beautiful extended montage accompanying the opening credits – soon turns regrettable, when Jeremy, after a night of drinking and drug-taking, disappears without a trace. While Steph remains in Cambodia to be first-hand for any news, Alice and Dave return to their home in Sydney. Their formerly happy working-class lives have been punctured by this confusing, but irreparable circumstance, and each is individually shaken. Optimistic, they try to keep their grief and their gradual emotional distancing from their young children and continue with their work. Truths about the night begin to emerge and we are revealed, via flashback, snippets of their holiday. These are hints to the truth, and motivations behind Jeremy’s business trip. Dave, obviously scared and anxious, is keeping something to himself, while Alice, aware that drugs influenced the evening’s party and concerned about the suspicious behaviour of her husband and the instability of her sister, desires police involvement. Even more damning details emerge, forever challenging the familial bonds. Courtesy of Transmission films I have four double passes to give away for Delicacy, the upcoming French film starring Audrey Tautou, which hits Australian cinemas Thursday May 3. To enter, all you have to do is email your name, address, and the title of your favourite film starring Audrey Tautou, to andrew.buckle22@gmail.com with 'Delicacy' as the subject. Restrictions may apply on use of the passes, but will be clearly specified. Winners will be notified via email. Entries close at midnight next Tuesday, May 2nd. Based on David Foenkinos’ best selling novel of the same name, Audrey Tautou is enchanting in this moving and humorous film that shows us sometimes we can’t choose who we fall in love with. There is a brand new, action packed trailer for G.I Joe: Retaliation now available. It has a scheduled Australian release on August 2, 2012. In this sequel, the G.I Joes are not only fighting their mortal enemy Cobra; they are forced to contend with threats from within the government that jeopardise their very existence. The film stars D.J Cotrona, Byung-hun Lee, Ray Park, Adrianne Palicki, Jonathan Pryce, Ray Stevenson, Channing Tatum with Bruce Willis and Dwayne Johnson. Directed by Jon M. Chu. Marvel's The Avengers has smashed the Australian box office on its opening day of release with a record breaking AUD$6 million (USD$6.2 million). This opening makes The Avengers the biggest Marvel Studios opening day ever - well ahead of Iron Man 2 (AUD$1.8 million) and represents the number one Disney Studios opening day, ahead of The Chronicles of Narnia: The Lion, the Witch and the Wardrobe (AUD$3.5 million). "The most anticipated blockbuster of the year, Marvel's The Avengers has really lit up the box office with this stunning opening - Disney and Marvel's biggest yet in Australia. The Avengers is testament to fabulous storytelling with a blockbuster cast and world-renowned director - this superhero epic is a must-see for all Australian fans and film lovers! ", said John Cracknell, senior vice president and managing director The Walt Disney Company, Australia. John, I agree wholeheartedly. It is so satisfying to see a big-budget franchise film utilise a strong script so effectively and create a fun film brimming with epic action, good humour and well-developed characters. The opening puts the film at the number two position of all time openings behind Harry Potter and the Deathly Hallows Part 2 (AUD$7 million) and easily surpasses the combined individual opening days of each Marvel superhero film with an Australian opening. Pretty big. The exciting debut trailer for the John Hillcoat directed, Lawless, which has just been selected to play in Competition at the Cannes Film Festival, has been released. Set in Depression-era Franklin County, Virginia, a bootlegging gang is threatened by authorities who want a cut of their profits. What is immediately striking about this film is the stellar ensemble cast - Shia Labeouf, Tom Hardy, Gary Oldman, Guy Pierce, Jessica Chastain and Mia Masikowska - but having Nick Cave and John Hillcoat (The Proposition) team up again makes this one of the year's most anticipated releases. I reviewed Spirited Away on May 3, 2011. For the purposes of my April Ghibli marathon I have made alterations and re-posted the review here. Spirited Away is another absolutely wonderful animated feature from Studio Ghibli and writer/director Hayao Miyazaki. Perfect for the whole family, this atmospheric and beautifully crafted fantasy realm is richly endowed with stunning visuals, inspired imagination, relevant themes and a consistent mystery at the heart of the story. 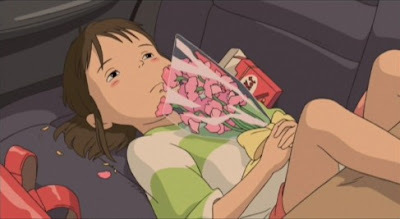 Spirited Away won the Oscar for Best Animated Feature at the 75th Academy Awards and tied with Bloody Sunday for the Golden Bear at the 2002 Berlin International Film Festival. Pixar director John Lasseter (Toy Story and Toy Story 2), an admirer of Miyazaki, was approached by Walt Disney Pictures to supervise an English-language translation for the film's North American release (which wasn't until September 2002, following its release in Japan in 2001). Spirited Away became the most successful film in Japanese history, grossing over $274 Million worldwide. It is one of the most magical family feature films I have ever seen - and this recent viewing is only my second one - and one I would most certainly have enjoyed immensely if I had seen it back in 2002.
the best superhero film ever? Pretty close. Coinciding with Anzac Day tomorrow, there are three new films hitting Australian cinemas. With The Avengers hitting screens I know it is already a good week, but throw in the critically acclaimed Cafe De Flore and Wish You Were Here with limited releases and it has the potential to be a great week. The Avengers - Ever since Nick Fury (Samuel L. Jackson) appeared at the end of Iron Man (2008) and mentioned the Avengers Initiative, fans have been patiently anticipating the arrival of the adaptation of the Marvel comic book series, first published in 1963, which utilizes all of their favourite characters side by side - Iron Man, The Incredible Hulk, Thor, Captain America, Hawkeye and Black Widow. What is interesting, and it is apparent, is that writer/director Joss Whedon (Buffy, Serenity) has not utilized the Avengers comic books as the sole point of origin here, but elements of what have come before in the preceding films of the Marvel Cinematic Universe. So, while it is not imperative to have seen each of the lead up films, they will aid your understanding of the relationships between the characters and how they all fit into the Initiative. The Avengers has been hyped as one of the biggest movie events of 2012, and I am very pleased to say that it is one of the best blockbusters - in terms of story, character, visual spectacle and entertainment value - to grace our screens in some time. Full review can be found via the title link. Cafe De Flore - Two stories of love and responsibility separated by four decades have a common link in this drama from writer and director Jean-Marc Vallee. In 2011, Antoine (Kevin Parent) has a life most people would envy - he's a successful club DJ living in Montreal with an international following, he has a beautiful girlfriend Rose (Evelyne Brochu), and is raising two healthy daughters. However, Rose is not Antoine's first love, and he's still infatuated with his ex-wife Carole (Helene Florent), the mother of his children. In 1969, Jacqueline (Vanessa Paridis) is a single mother who is raising a seven-year-old son Laurent (Marin Gerrier). Laurent was born with Down's Syndrome, and is not expected to live past 25; Jacqueline is determined to whatever she can for her boy during the time he has, but as the stress of these demands take their toll, we learn that she and Carole share a special connection. Wish You Were Here - Screen veteran Kieran Darcy-Smith (The Square, Animal Kingdom) makes his feature debut directorial debut with this ambitious non-linear drama focusing on a group of friends who lives are irreparably changed after one of them goes missing during a spontaneous vacation in Cambodia. Alice (Felicity Price) and Dave (Joel Edgerton) are about to become new parents when they agree to join Alice's little sister Steph (Teresa Palmer) and her new beau Jeremy (Anthony Starr) on a sun-soaked trip to Cambodia. Their tropical retreat quickly turns bad, however, when Jeremy vanished without a trace. Meanwhile, as the investigations into Jeremy's disappearance begins to reveal the nefarious motivations behind their trip, the remaining three struggle to carry on with their lives in Sydney amidst the threat that even more damning details will emerge. Weekly Recommendation: The Avengers is a must-see. I will be watching it again. It is not just high-quality popcorn entertainment, but phenomenally satisfying cinema. I have heard nothing but positive reports about Cafe De Flore, and Wish You Were Here received five stars from Empire Magazine. The last two Australian films to receive that rating: Animal Kingdom and Snowtown. I am very much looking forward to it. I suggest giving it a chance too. Princess Mononoke is one of writer/director Hayao Miyazaki’s longest and most complex films. Though it becomes somewhat difficult to follow at times, I find it to be one of his most imaginative and artistically triumphant creations to date, and one of his most emotionally rewarding fables. For a brief period (until Titanic was released a few months later) it was the highest grossing film of all time in Japan, so it is also one of Miyazaki’s most popular films. It won Best Picture at the 21st Japanese Academy Awards and incredibly was selected as Japan’s submission into the Academy Awards for Best Foreign Language Film. Rarely before has such energy between animation and storytelling been so apparent. Remember, this was released when Pixar Studios had just one film (Toy Story) to their name. The magnificently inventive Mononoke, blending myth and fantasy with stirring ideology and real-world ecological problems, has just as much tension as most live-action films, and though these beautifully realized animals and human characters are completely hand-drawn (unfathomable), we still find ourselves unsettled by the various conflicts and fear for them. It is nothing short of a spectacle and almost immediately (that rampaging boar with black tentacles covering its body) you know you are watching something groundbreaking. The engrossing central conflict between humans and these mythical creatures, blended with this stirring environmental awareness, might just be Miyazaki’s masterpiece. If it weren’t for the pure magic of Spirited Away (2001), I’d say it would be. 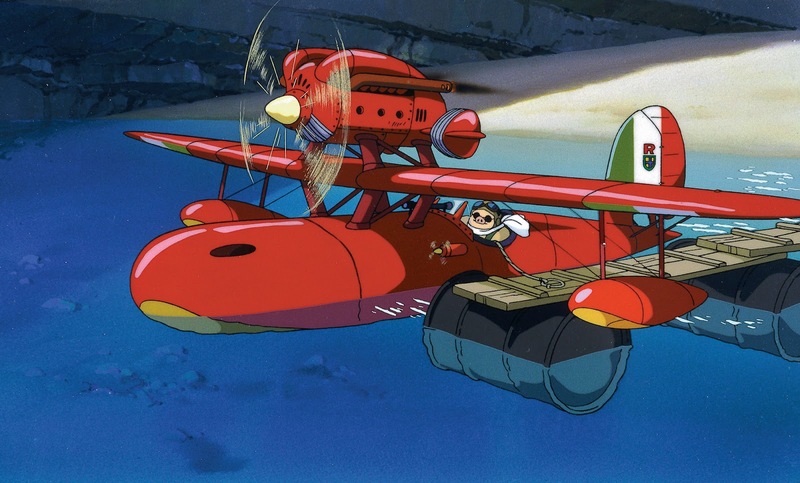 Porco Rosso is the sixth film directed by Hayao Miyazaki and was released by Studio Ghibli in 1992. At the centre of his tale is not a young female heroine, or a child, but an unlikely male hero– a chauvinistic Italian WWI fighter pilot named Porco Rosso. Porco Rosso is the first Miyazaki film I have experienced that has a clearly defined historical and geographical setting (the Great Depression and the Adriatic Sea) but he still manages to infuse the tale with rich fantasy. The story follows Rosso, a deserter from the Italian military (who are still in pursuit of him), now earning a living as a freelance bounty hunter chasing ‘air pirates’ who prey on cruise ships on the Adriatic. He lives on his personal deserted island retreat, hunts down the bandits in his bright red bi-plane and frequents a popular resort run by Gina, the widow of one of his fallen war buddies, a close friend, and the woman his heart swells for. But what makes Rosso unique is his appearance – that of a pig. This is courtesy of a mysterious curse placed on him during an ill-fated mission, which resulted in his entire squadron being wiped out. His affliction hasn’t hampered his skills in flight, but living in a world of tumultuous politics, under appreciated service, and an impossible romance, he is world-weary and cynical, and for lack of a better term, ‘pig headed’. Following an exciting opening sequence, which sees Rosso rescue a class of overly jovial school students who had been kidnapped by sky bandits, targeting the spoils present on their cruise ship, the bandits hire a strapping American, Donald Curtis, to take down Rosso. After engaging in a dogfight, which sends Rosso crashing to the ground (and declared dead by Curtis), he takes his damaged plane to a repair hangar in Milan, the territory of the Fascist Government hunting him, run by an elderly mechanic named Piccolo. He enlists his spunky granddaughter, Fio, to the job, and after initially being skeptical of her substantial technical prowess; Rosso is amazed by what she achieves. He takes her along with him to be of further mechanical service, but will his repairs and upgrades be enough to defeat his well-financed rival? Though the traffic to my site this week has been excellent (mostly Avengers related) it has been a quieter week in terms of content. I had a blogging-free weekend, which was courtesy of working a lot and having a life. To be honest, I wasn't really motivated to write anything either. There are no screenings lined up this week, having already seen The Avengers and having to wait to see Wish You Were Here and Cafe De Flore (which could equal a fantastic week of releases - a nice change) after their official release on the 25 April. Between now and then, there will be some more Ghibli and a Korean film or two - and I'll probably just catch up on some casual viewing. That pile of DVDs gets bigger every week. 1. The Avengers. 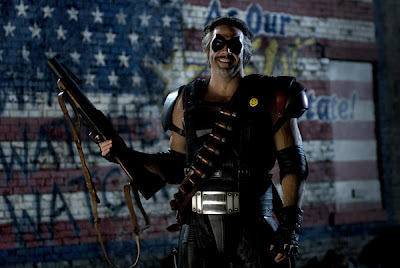 My review was one of the first to be available online (I was very lucky to see the film when I did - thanks to Mr. Chris Elena) but I can confirm that it is not just a fantastic superhero film, but a really entertaining and satisfying piece of cinema. Don't miss it. 2. A Night to Remember DVD Giveaway. 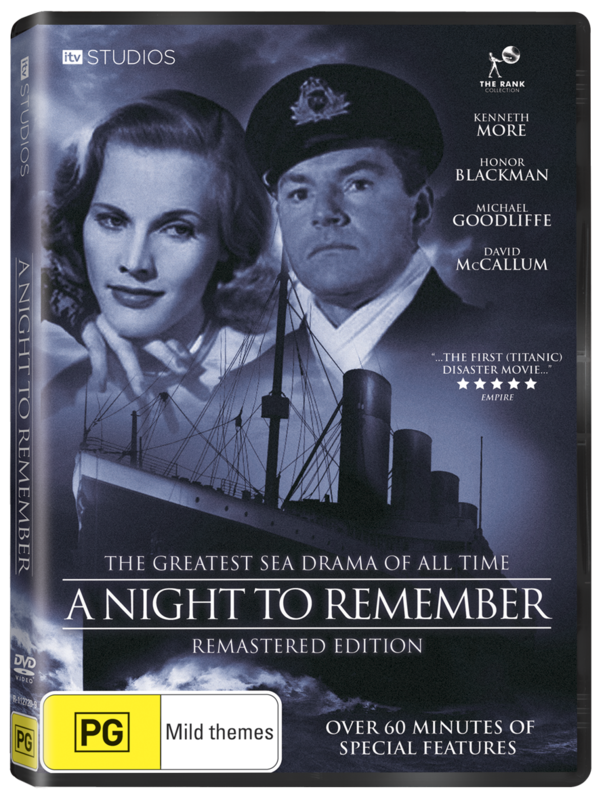 If you are an Australian resident, I have a great chance for you to pick up a copy of A Night to Remember, the classic titanic tale that James Cameron used for a blueprint for his memorable blockbuster. Courtesy of Roadshow Entertainment, I have five copies to give away and I would love to get a few more names into the mix. All you have to do is email me your name and address, with A Night to Remember in the subject. If you don't follow me on Twitter, or email subscribe to my blog, this is a consideration. 3. The Official 2012 Cannes Film Festival Line-up. Fantastic line-up. Lots of films to look out for later in the year. Especially at MIFF. Alex reviews American Psycho, a first-time watch. One film I have been trying to see since SFF last year is Tomboy. Tom Clift reviews it this week. Many credit Days of Heaven as Terrence Malick's best work. It is a pretty extraordinary film. Stevee watched it for the first time this week. 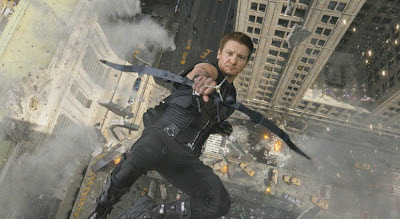 For reassurance that The Avengers is awesome and some info about the 3D, be sure to check out Sam's review @ An Online Universe. Alex Withrow @ And So It Begins has recently been working on Earrings, a film he has written and directed. I wish him all the best. You can find a log of his experiences via the link. Blake @ Castle Co-Op has recently started an awesome series where he and some guest writers are reviewing every film in the prestigious fan-voted IMDB Top 50. He kicks it off with Paths of Glory. Sam, in his Sunday personal, searched for clarity and raises some interesting questions about how we evolve as people. Andrew takes an in-depth look at some of the fantastic moments in Serenity. Corey looks at how Lockout successfully reconstructs the action genre. The Kid in the Front Row reflects on Eternal Sunshine of the Spotless Mind. For his 500th review, Groggy takes a look at Michael Mann's The Insider. Littlerock gets a 10/10 from Colin at Pick 'n' Mix Flix which means it is essential viewing. Finally, tune into the most recent MOTM Lambcast to hear the gang discuss Inglourious Basterds. The official 2012 Cannes Film Festival line-up has been announced. Now less than a month away, running between May 16-27, many have been anticipating (and speculating) the possible selections made by the festival directors, with many world-class filmmakers boasting new features in 2012. Some, like Paul Thomas Anderson's The Master, Terrence Malick's The Burial and Wong Kar Wai's The Grandmasters, were rumoured to be in contention, but either weren't ready or didn't make the cut. Nanni Moretti has been named as President of the Jury. A total of 54 films, representing 26 countries, were selected from the 1,779 films submitted. Opening the festival, as had been announced prior, is Wes Anderson's Moonrise Kingdom. The Closing Night film is directed by the late Claude Miller, Therese Desqeuyroux. 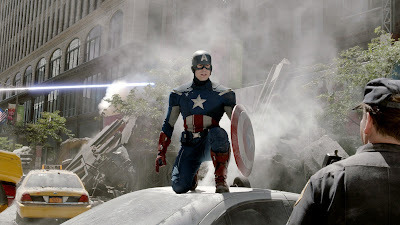 The Avengers, the superhero film to end all superhero films, produced by Marvel Studios, and distributed by Walt Disney Pictures, has a scheduled release in Australia on April 25, and a U.S release on May 4. Written and Directed by Joss Whedon (Buffy, Serenity), and featuring a stellar creative team, The Avengers is the sixth installment in the Marvel Cinematic Universe. Though most sessions will be screened in post-production converted 3D, I saw the film in 2D so at this point I can’t comment on its success in 3D. 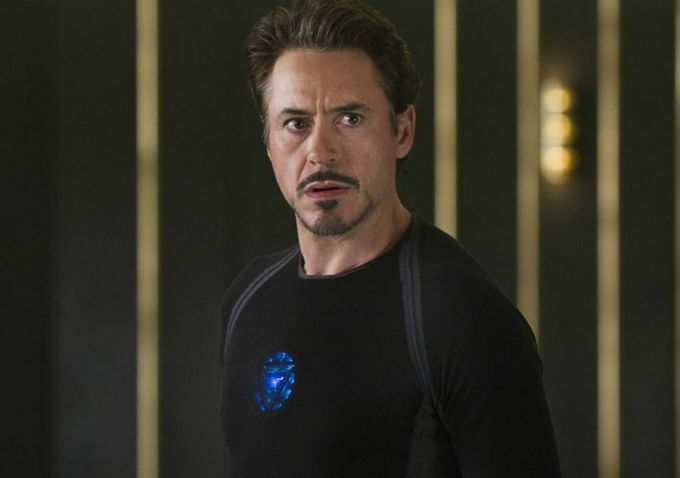 Ever since Nick Fury (Samuel L. Jackson) appeared at the end of Iron Man (2008) and mentioned the Avengers Initiative, fans have been patiently anticipating the arrival of the adaptation of the Marvel comic book series, first published in 1963, which utilizes all of their favourite characters side by side. What is interesting, and it is apparent, is that Whedon has not utilized the Avengers comic books as the sole point of origin here, but elements of what have come before in the preceding films of the Marvel Cinematic Universe. So, while it is not imperative to have seen each of the lead up films, they will aid your understanding of the relationships between the characters and how they all fit into the Initiative. The Avengers has been hyped as one of the biggest movie events of 2012, and I am very pleased to say that it is one of the best blockbusters - in terms of story, character, visual spectacle and entertainment value - to grace our screens in some time. This past weekend saw the 100-year anniversary of the sinking of the Titanic. 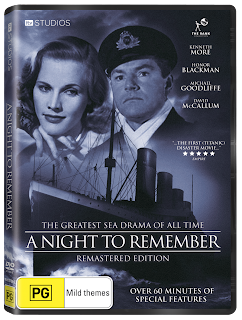 To mark this historic event, ITV Studios is releasing a remastered version of the classic Titanic tale, A Night to Remember on DVD and Blu-Ray. Courtesy of Roadshow Entertainment, I have five copies of the remastered DVD to give away to Australian readers. Entry is simple. To be considered, you must either email subscribe to 'Film Emporium', follow 'Film Emporium' on Facebook or follow my twitter handle (@buckle22) and to enter the giveaway, send your full name and postal address to andrew.buckle22@gmail.com with the film's title (A Night to Remember) as the subject. The five winners will be sent a return email acknowledging their success. Entries close at midnight next Wednesday, 25th April. Please Note: This giveaway is only valid to people living in Australia for mailing purposes. Often considered one of the all time great pieces of British cinema, A Night to Remember is the original masterpiece about the night the unsinkable ship sank into the Atlantic Ocean. 1,502 people were killed, including Captain Smith and Thomas Andrews, who went down with the ship he created. This dramatisation remains one of the classic and best re-tellings of this incredible historical event, that is still remembered today. The re-mastered version of the Golden Globe winning film includes over 60-minutes of special features and stars Kenneth More, Honor Blackman, Michael Goodlife and David McCallum. The Lady hits Australian cinemas on Thursday April 19. The Lady, directed by Luc Besson from a screenplay by Rebecca Frayn, covers an extraordinary tale that deserves to be told – and the final 20 minutes are undeniably moving – but for the most part this earnest but unconvincing film is supremely disappointing. It is a pity that the rest of the film lacked the heart and soul present in the emotionally-charged conclusion, because such an iconic female figure deserved a lot better than this lackluster, if well-intentioned, screen portrayal. We never feel the emotional impact of the struggles of Myanmar’s Nobel Peace Prize-winner Aung San Suu Kyi (Michelle Yeoh) in Burma, despite being restricted to many years of house arrest in Rangoon and having her closest colleagues and many of her student supporters imprisoned and/or killed. She endures a self-motivated hunger strike, finds her righteous morals opposed by threats from the military junta, and is continually forced to overcome prolonged isolation and emotionally crippling separation from her devoted family. There are five new films hitting Australian cinemas on Thursday April 19 - The Lucky One, Footnote, The Lady, StreetDance 2 and Romantics Anonymous, which continues this ordinary streak of releases. The Lucky One - U.S Marine Sergeant Logan Thibault (Zac Efron) returns from his third tour of duty in Iraq, with the one thing he credits keeping him alive - a photograph he found of a woman he doesn't even know. Learning her name is Beth (Taylor Schilling) and where she lives, he shows up at her door, and ends up taking a job at her family-run local kennel. Despite her initial mistrust and the complications in her life, a romance develops between them, giving Logan hope that Beth could much more than his good luck charm. It is not just dull and predictable, but a serious drag. It is all explained in my review. Footnote - Eliezer and Uriel Shkolnik are both eccentric professors, who have dedicated their lives to their work in Talmudic Studies. The father, Eliezer, is a stubborn purist who fears the establishment and has never been recognised for his work. While his son, Uriel, is an up-and-coming star in the field who appears to feed on accolades, endlessly seeking recognition. Then one day, the tables turn. When Eliezer learns that he is to be awarded the Israel Prize, the most valuable honor for scholarship in the country, his vanity and desperate need for validation are exposed. Uriel is thrilled to see his father's achievements finally recognised but, in a darkly funny twist, is forced to choose between the advancement of his own career and his father's. Will he sabotage his father's glory? Courtesy of Hoyts Distribution, there is a trailer for Iron Sky available online. It hits cinemas May 10. Iron Sky is directed by Timo Vuorensola and stars Julia Dietze, Peta Sergeant, Gotz Otto, Christopher Kirby and Stephanie Paul. In the last moments of World War II, a secret Nazi space program evaded destruction by fleeing to the dark side of the moon. During 70 years of utter secrecy, the Nazis construct a gigantic space fortress with a massive armada of flying saucers. Soon, this unstoppable attack fleet with swarm towards Earth, heralding the triumphant return of the Fourth Reich. 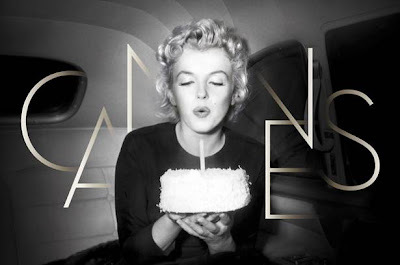 Andy from Fandango Groovers has come up with another awesome blog-a-thon - pick your favourite year in the history of film and support your claim with five examples of films from that year. I was inspired by Tom @ Movie Reviews By Tom Clift and Sam @ Duke and the Movies, but here is a link to the homepage where you can find links to all those who participated. 2007: There Will Be Blood, No Country For Old Men, Ratatouille, Before the Devil Knows You're Dead, 4 Months, 3 Weeks and 2 Days. Toy Story was one of my most viewed films as a child - it came out in cinemas when I was 7 - and the other four are firmly cemented in my Top 100 films. Se7en and The Usual Suspects are in my Top 10. No question. I would love to hear your thoughts on this selection. 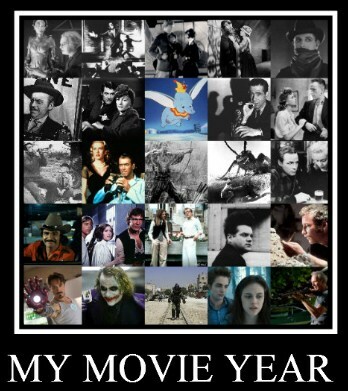 What is your Movie Year? Hey everyone, before I get into this week's links I thought I would quickly re-cap another busy week. 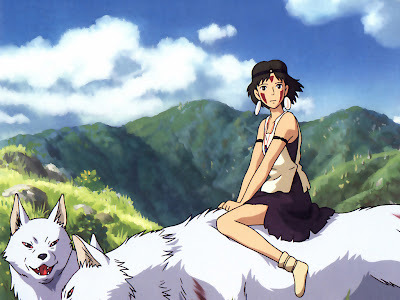 I continued my Ghibli marathon with first viewings of My Neighbour Totoro and Kiki's Delivery Service, and a second viewing of Princess Mononoke, which is one of the great animated films I have ever seen. In fact, they all are. Battleship and The Deep Blue Sea hit cinemas last Thursday, and The Lucky One and Footnote hit cinemas this week. Check back later in the week (Friday morning to be exact) for a review of The Avengers, and also expect reviews of The Lady, Porco Rosso and Mononoke to also be uploaded this week. Be sure to stop by Popcorn Junkie for all the latest news on the upcoming blockbusters. 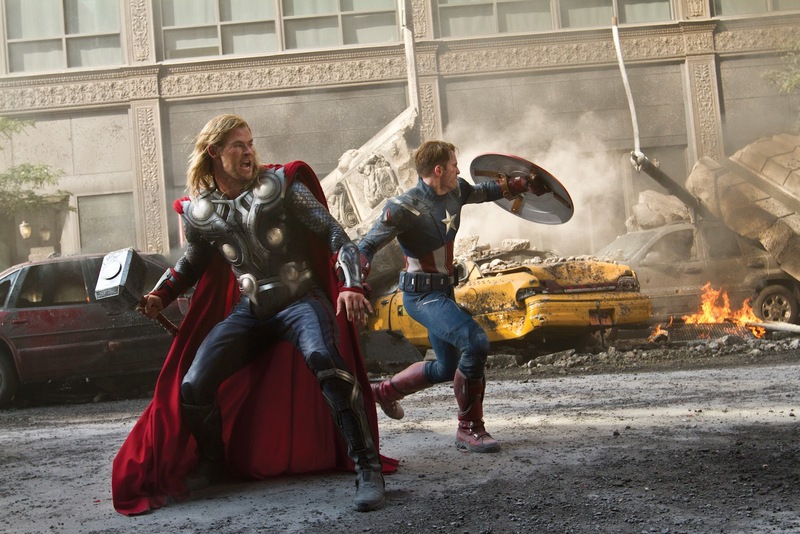 Cameron has exclusive clips and trailers from The Avengers, Prometheus and The Amazing Spiderman. Sam reviews Vanishing on 7th Street, a little-seen horror film. Ruth contributes a review of Spirited Away to An Online Universe as part of Miyazaki Month. In another instalment of the The Directors, Alex looks at Oliver Stone, one of my favourite directors...sometimes. Plenty of reviews have been coming out of the U.S for Cabin in the Woods. I don't want to read anything about it before going in, but Nick has reviewed the film at Anomalous Material. Sure to be a great read. For anyone looking for an official synopsis for Tarantino's Django Unchained, you can find it at Nikhat's site, Being Norma Jean. James reviews Vivre Sa Vie, one of my favourite Godard films. Sati's review of Shame is the best review of the film I have read yet. A must read. 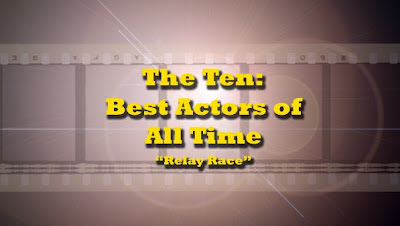 Ruth, Stevee and Tyler have all posted lists recently: Moments of Cinematic Awesomeness. I am inspired to complete this myself, but it is so very difficult. Sam reviews one of two Tarantino I like but not love, Jackie Brown. I really should own this one. John looks ahead to the Summer of movies. Simon lists his 10 Best Sports Movies. Colin and I didn't agree on The Deep Blue Sea, but his review is well worth a read. Hope everyone has a great week. This blogging gig is getting tough. So much to do - and finding more and more every week. Footnote hits Australian cinemas this Thursday, April 19. Footnote is an Israeli drama written and directed by Joseph Cedar. It screened at the 2011 Cannes Film Festival, where Cedar won Best Screenplay and it was Israel’s nominated representative in the Foreign Language Film category at the Academy Awards. The story revolves around a power struggle between a father and son who each teach at the Talmud department of the Hebrew University of Jerusalem. It is a fresh, stirring and stimulating portrait of professional rivalries and the merits of academia, especially in a field this unknown to a lot of people. Footnote is dramatically gripping, inventively put together (using an array of unique and energetic stylistic choices) and often amusing, and though it features a layered story and focuses on a potentially dry concept, it is pleasant and easily digestible. Uriel Shkolnik (Lior Ashkenazi) is a charismatic and popular academic, well regarded by the department and respected by his pupils. 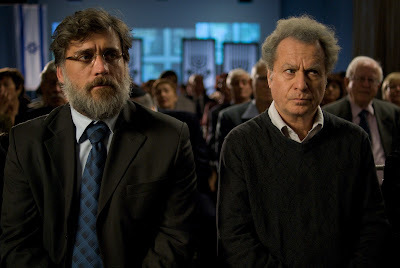 The film opens with an awards ceremony (an extraordinary single take) where Uriel is accepting his election to the Israel Academy of Sciences and Humanities. The focus of this sequence, however, is on his father Eliezer (Shlomo Bar Aba). The camera never leaves his face as he looks on in a combination of boredom, bitterness and envy. As a stubborn old purist, Eliezer has grown frustrated that his lifetime of research and dedication to Talmudic Studies has continually been overlooked. The Lucky One hits Australian cinemas on Thursday April 19. The Lucky One, directed by Australian director Scott Hicks (Shine, Snow Falling On Cedars and No Reservations) is the adaptation of the Nicholas Sparks novel of the same name. It is the seventh of Sparks’ novels to be adapted to screen, with other titles including A Walk to Remember, The Notebook and Dear John. While his novels have proven to be popular, the reception to the films has been less than positive. The Lucky One, lacking in dramatic weight and convincing characters is poorly scripted, dully sentimental and predictable, fueled by a premise that goes nowhere and stuffed with endless genre clichés. It opens in Australian cinemas on April 19. Zac Efron stars as Logan Thibault, a U.S Marine Sergeant who returns home to North Carolina following his third tour of duty in Iraq. He credits his survival solely to a photograph of an unknown woman, likely a girlfriend or relative of one of his fellow platoon members. Having bent down to pick up the photograph and examine it, he miraculously avoided being caught in a fatal explosion. Living with his sister, and following an unsuccessful reintegration into civilized life, he sets out on his own to find his guardian angel and to tell her his story. Logan learns that she runs a family-owned local kennel and that her name is Beth (Taylor Schilling). Unable to find the words to tell her his story, she mistakes his arrival and interest as being for an advertised job opening. When he reveals that he is a marine, he is met by her distrust, but her Nana (a one-note Blythe Danner), sensing he would be useful, hires him. Beth has a son, Ben (Riley Thomas Stewart), who warms to Logan (they play chess together, and Logan, who has a hidden musical talent, is instrumental in helping Ben find find confidence), and a brutish husband, Keith (Jay R. Ferguson), who she is separated from. 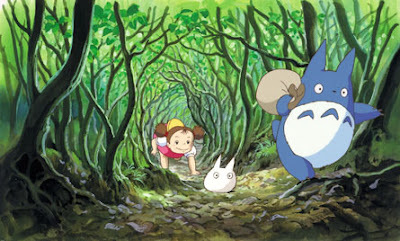 My Neighbour Totoro, the 1988 children’s animated classic, is the third film released by Studio Ghibli. It is directed by Hayao Miyazaki and regarded as one of the most adorable children’s stories ever made. It is certainly one of the most optimistic – and while the film is remembered for the fantastic Totoro creatures it is, as always, the human story that is most enriching and fulfilling for the viewer. Miyazaki has crafted a timeless classic; a film that utilizes the rich imagination of a child like few others and beautifully captures the necessary co-existence of reality and fantasy when the real world gets tough. Satsuki (ten) and Mei (four) are moving into their new home in the Japanese countryside with their father, who is a university professor. Their mother, who is ill with tuberculosis, is recuperating at a nearby hospital. It is the hope that their new home away from the city will help their mother to get better. Arriving at the place, the girls can barely contain their excitement; in fact they don’t even try to, racing around the exterior garden at a frenetic pace and laughing with pure joy, full of curiosity and uninhibited childlike awe. We are given plenty of time early to get to know these girls, and they’re impossible not to like, as well as their relationship with their father, who shares their playful spirit, and their concern for their mother’s health. Battleship is exactly what we all expected from the trailers, and from a film that has a Hasbro board game in its pedigree. Director Peter Berg (Hancock, Friday Night Lights) also seems to have adopted the Michael Bay School of epic action-adventure filmmaking. Thankfully, he rejects some of Bay’s top tips. It is far less smarmy for one, and actually utilizes the female characters commendably. I was also glad it didn’t take itself too seriously because it made it a bit of fun, and in all honesty, few viewers are going to. It seems to have been written as a farce or a parody – at least I hope it was. 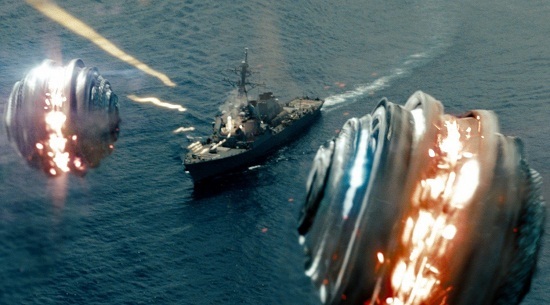 While the tension and the stakes are there (barely, but present nonetheless), Battleship is unashamedly cheesy. It throws in corny curveballs, implausible characterizations, blatant Navy worshipping and patriotism and plenty of out-of-place attempts at humour, amidst these serious situations. I’d even say it even turns to bashing itself (and in extension, the blockbuster – though this is very uneven) to produce laughs. It is trashy, brainless popcorn entertainment in every way, but I was never bored during the film – often so bad it was amusing, and on a couple of occasions quite impressive – so that’s something. Kiki’s Delivery Service is a 1989 Japanese animation written and directed by Hayao Miyazaki, and is the fourth theatrically released Studio Ghibli film, following Castle in the Sky, Grave of the Fireflies and My Neighbor Totoro. 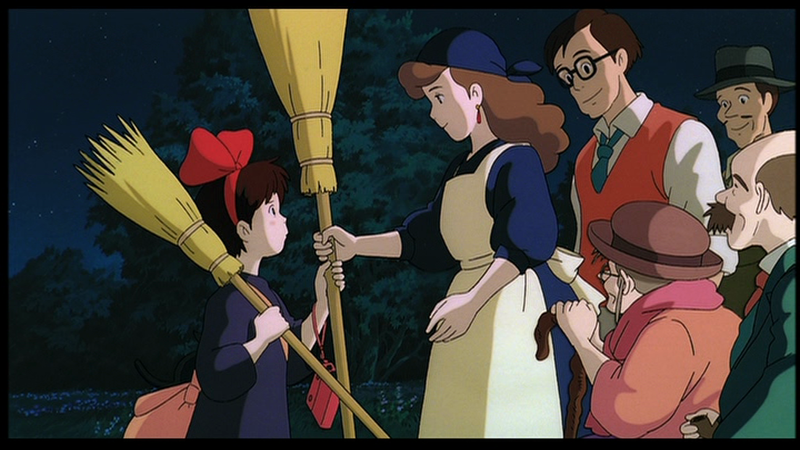 Like Castle in the Sky and Tororo, Kiki’s Delivery Service won the Anime Grand Prix in 1989. This sweet and heartwarming story focuses on Kiki, a witch who has just celebrated her thirteenth birthday. As per tradition, Kiki has reached the age when witches must leave their families for a year and make a new home for themselves to commence their training, and search for their special skill. With the arrival of the full moon prompting Kiki’s unwavering enthusiasm to leave, she sets off at midnight on her mother’s broom, dissuaded from using a smaller one she had made herself, with her most loyal companion, her talking cat Jiji. Her mother is the local alchemist, having arrived in the town when she was thirteen. After coming-to-terms with flying, and surviving several scrapes – a storm and an impromptu landing in a train car, where they spend the night – the two land in the picturesque and densely populated seaside town of Koriko. Kiki makes a rough start, mostly through her own insecurities, discovering that she is different and not exactly welcomed in Koriko. Soon she befriends a kind and pregnant baker named Osono, who offers her a room in the attic, a job at the bakery and a means to open her desired business – a flying delivery service. Kiki can utilize her broom skills and so begins a number of misadventures for the young heroine. The FCCA Annual Awards for the films of 2011 were held at the Australian Film Television and Radio School at the Entertainment Quarter in Sydney last night. There are just two new films opening in Australian cinemas this week - Battleship, Peter Berg's Tranformers-like epic scale action-adventure influenced by Hasbro's classic naval combat game, and The Deep Blue Sea, Terence Davies' adaptation of Terence Ratigan's 1952 play, starring Rachel Weisz and Tom Hiddleston. Battleship - I am watching Battleship tomorrow night, so check back later in the week for my review. Weekly Recommendation: Have you see This Must Be The Place yet? Highly recommended. The Deep Blue Sea hits Australian cinemas on April 12. Prior to watching The Deep Blue Sea, I was not familiar with the work of Terence Davies, but amongst his directed films are The House of Mirth (2000) and Of Time and the City (2008). He has a very particular style that will certainly not appease all tastes, and to be honest, I don’t have any intention of watching any more of his films. The Deep Blue Sea is an adaptation by Davies himself of Terence Ratigan’s famous 1952 play – chronicling the story of a young woman who leaves her husband, a respectable High Court Judge, to continue a passionate affair with a younger RAF pilot. 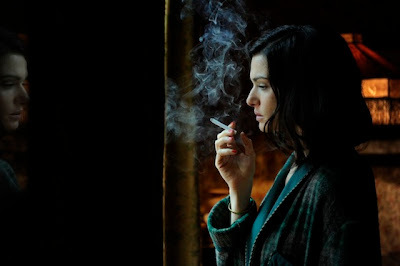 The majority of the film takes place in the flat of Hester Collyer (Rachel Weisz) on the day she had decided and ultimately fails to commit suicide. As she recovers, having been discovered by the landlady and other tenants, we are revealed to her story through a mosaic of flashbacks which explain her motivations. She is married to a High Court Judge, Sir William Collyer (Simon Russell Beale), and though living a comfortable lifestyle, the marriage is void of passion and she finds herself constrained. Seeking to have her sexuality awakened she starts a passionate affair with a handsome Royal Air Force pilot, Freddie Page (Tom Hiddleston), with whom she falls in love with. In short, it is love at first sight. Hester keeps the affair a secret, but upon William’s discovery, Hester moves into a small London flat with Freddie. Her former life of luxury is now reliant on the reckless Freddie, who often needs to leave London for work. Soon enough his affections diminish and their passion is lost. Hester faces a dilemma. She is emotionally desperate, but unwilling to return to her husband. When Freddie discovers the suicide note - addressed to him – the tension between the couple hits a boiling point and Hester tries desperately throughout the night and in the days that follow to explain her desperate actions and draw forgiveness from the man she thinks she loves. Jessica visits The Artist after all the fuss is over. 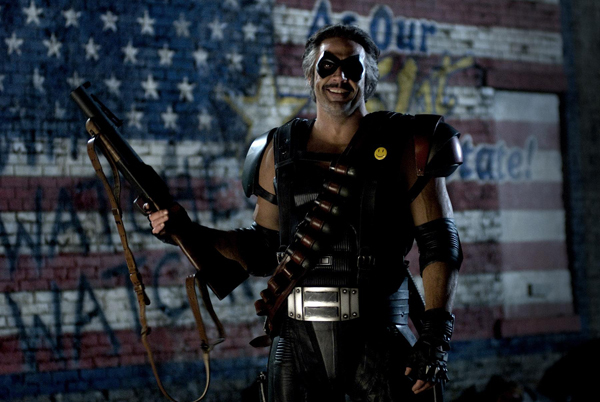 Richard and David discuss Watchmen in their latest episode of 'Behind the Panels'. I recently watched A Dangerous Method but did not share my thoughts. I was neither here nor there with the film. It wasn't especially bad, but not particularly good, either. Alice Tynan has a great write-up of the film if you are thinking of seeing it. Steven reviews Martin Scorsese's The Last Temptation of Christ. The Kid in the Front Row shares what he LOVES about the movies. If you are thinking about seeing American Reunion, Eugene at Film Blather might change your mind. He gets it spot on. Anna catches up with Weekend. I'm not going to read any reviews of Cabin in the Woods, but I believe the film is awesome. Brian reviews it at Dear Film. Stevee has just surpassed 300,000 hits on Cinematic Paradox. Recently she updated her Top 100 Films. Faust has a confirmed spot at this years Sydney Film Festival. I am contemplating seeing it. Bonjour Tristesse reviews it. Hope everyone had a great Easter long weekend, and has a great week ahead. This Must Be The Place is an unusual film. Its bizarre oddities aren’t anywhere near as hard to accept as the trailer suggests and it remains consistently intriguing and always entertaining. It is a rich character study and a wonderfully weird and ambitious American road movie from master Italian director, Paolo Sorrentino (Il Divo), directing his first English language film. This Must Be the Place played in competition at the 2011 Cannes Film Festival, and is one of the best films to hit screens in 2012 so far. Cheyenne (a performance of incredible precision from Sean Penn) is a former 80’s rock star living in his reclusive Dublin mansion with his devoted wife, Jane (Frances McDormand). Retired, but growing increasingly bored (or is it depressed?) by his purposeless, self-involved existence, he lives off his royalties and still dresses like his younger ‘Goth’ rock star self – dark clothing, wild unkempt hair, eye and face make-up, earrings and red lipstick. He shares touching moments with his wife and hangs out with one of his teenage fans (Eve Hewson), and is continually plagued by the knowledge that two teenagers committed suicide have been influenced by his lyrics. When Cheyenne hears that his father, with whom he has not spoken to in decades and was not on good terms with, is dying, he travels to the United States to be with him in his final hours. He arrives too late but later learns of his father’s humiliation at Auschwitz at the hands of a former SS officer, Aloise Lange, and his lifelong obsession with finding the man. It is believed Lange is hiding in American under a different name. Despite the skepticism of Mordecai Midler (Judd Hirsch), a professional Nazi hunter, Cheyenne borrows a truck from his friend Ernie Ray (Shea Wigham), and sets off on a road trip across America to track down the elusive war criminal. Grave of the Fireflies is a 1988 animated anti-war film from Studio Ghibli, written and directed by Isao Takahata. It is, I believe, an adaptation of the semi-autobiographical novel of the same name by Akiyuki Nosaka, intended as an apology to the author’s own sister. That is an extraordinary fact. Grave of the Fireflies, in short, is a devastating film. The story is punctuated by profoundly beautiful moments – both in the intricately animated visuals, and in the heartfelt relationship between the orphaned siblings, 14-year-old Saita and his 4-year-old sister, Setsuko – but it is an extraordinarily sad tale. Unexpectedly, it did not cause me to cry, and I will delve into one of the reasons I think this might be the case a little later. With their father away serving in the Imperial Navy, Saita and Setsuko live with their mother in the port city of Kobe. Towards the end of WWII the city is firebombed by American bombers and almost completely destroyed. With their mother severely wounded and taken to hospital (where she later dies from her burns), the siblings are left to fend for themselves. They initially stay with their contemptuous aunt, their father’s sister, but she resents the time and money they require, has little affection for them and views them as a burden. She calls them lazy and thankless and criticizes Seita for not joining the Navy like his father, declaring that he sits around and does nothing, and doesn’t deserve the food she cooks and serves for them. He makes a choice, when his mother can no longer protect Setsuko, to devote his life to protect his sister and to choose the right moment to relay the news of their mother's death to her. This is what makes the film undeniably affecting. Paju, a 2009 South Korean film directed by Park Chan-Ok, is a challenging, but richly rewarding drama, chronicling the complex relation between a teenage schoolgirl and the husband of her older sister, over an eight year period. That is detailing the story in the simplest terms possible (and I will go into more detail later) and explaining it in that way feels like it is misleading. The film does not go to the places suggested by this synopsis, but it is full of surprises and effective as both a study of character and of the titular town (a conflict-riddled site of proposed development existing close to the North/South Korean border). Paju’s story is nuanced, densely layered and never fails to be involving, and is aided by some strong characters and excellent performances. 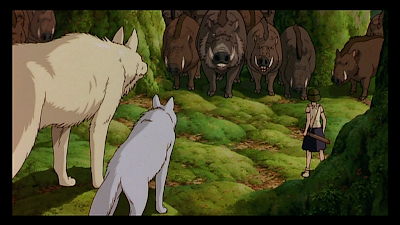 The way the characters are introduced and either feature at the centre of the story or are slightly sidelined, is very carefully considered by Chan-Ok. An example of this is apparent in the film’s first two sequences. We are initially introduced to a beautiful young woman, Choi Eun-mo (Seo Woo), riding in a taxi. It seems to be the foggy early hours of the morning and she is being driven into Paju. Who she is and the reasons she is entering Paju is unknown to us at this time. Before it is explained the film then jumps back eight years, and shifts the focus to a man in his mid 30’s, Joong-shik (Lee Sun-Gyun). While these two will share the screen for most of the film, at this point we aren’t sure whose story we are going to follow. I am currently working on a couple of reviews that I hope to have posted later this afternoon. In the meantime I thought I would upload a couple of tracks from the theme of Dario Argento's giallo horror masterpiece Deep Red, one of the finest films I have seen so far this year. I re-watched it the other night and can't get the Goblin score out of my head. Part of what makes it such an unforgettable experience is this score by Goblin, who would also score Suspiria and Tenebre for Argento. Both of them are essential viewing too. Here is Deep Red's infamous main theme and the track used in one of the film's creepiest scenes. I hope it persuades you all to give it a go. American Pie is back. It is actually the eighth installment in the American Pie film series (how did that happen?) but only the fourth in the original series, which culminated in American Wedding (2003). American Reunion is written and directed by Jon Hurwitz and Hayden Schlossberg (Harold and Kumar Escape from Guantanamo Bay) and the premise is to once again round up the old gang in East Great Falls for their 13-year High School Reunion. Jim Levenstein (Jason Biggs), Kevin Myers (Thomas Ian Nicholas), Chris ‘Oz’ Ostreicher (Chris Klein) and Paul Finch (Eddie Kaye Thomas) decide to return home a few days before to give themselves plenty of time to catch up and allow some freedom from their daily lives, and hopefully from the presence of Stifler (Seann William Scott), who still lives there. 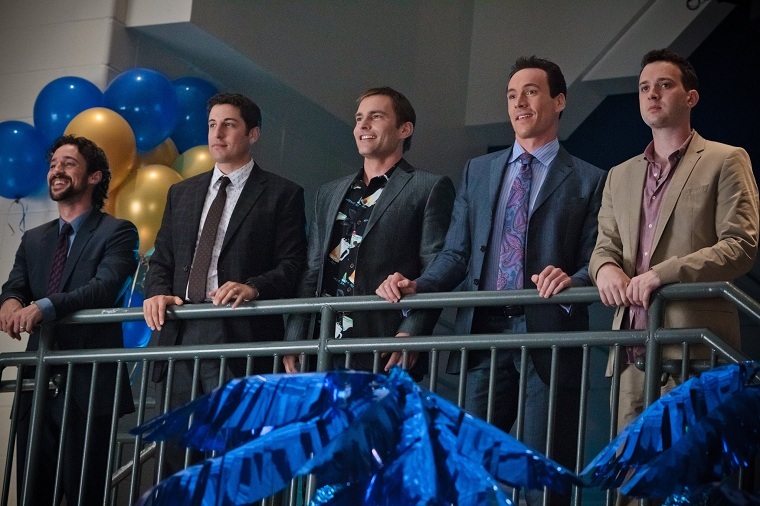 Of course, after no time at all Stifler turns up, and ecstatic to see his old buddies, proposes they party like it is 1999, and find the spirit of their youth. While die-hard fans will relish the gang’s return, and I’d like to say that the film re-captures the classic gross-out antics of 1999’s American Pie, but it honestly never comes close.